HUGE! rare living area for this model! Plenty of space for the family!! Fully Remodeled, Modern, yet casual Brick Ranch Home. Backs to walking path / open space!!! TAXES ARE ALMOST HALF OF COMPARABLE HOMES ON MARKET CURRENTLY! Coordinated custom color scheme & Design! Yes, it has a seperate Dining room/area!! 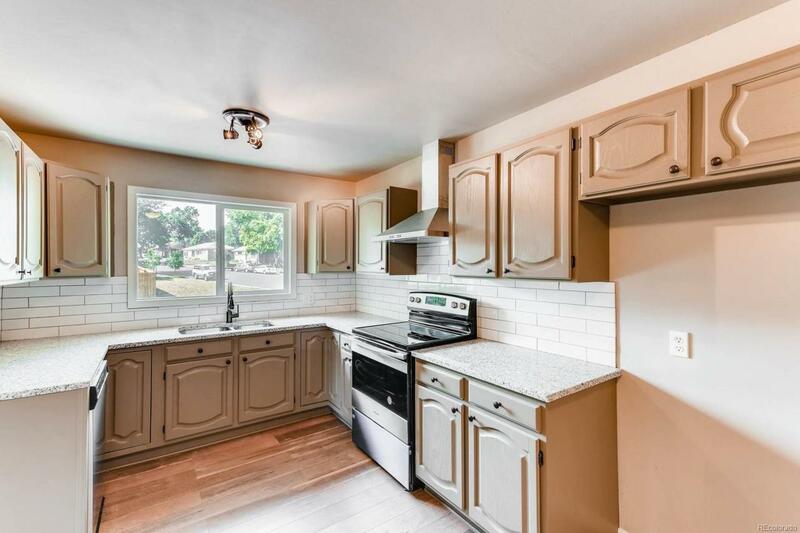 BRAND NEW Stainless Appliances with Ceiling Drop Range hood. NEW Granite. New backsplash. BRAND NEW SawCut Laminate Floors on entire first level. (No Boring same old oak floors, or carpet!) New Carpet in all lower level. Fully Remodeled bathroom up with new vanity, quartz top, all new tile. All New 6 panel doors with rolling Barn door. Rare fireplace for this model. Newer Windows. A/C. New paint in/out. Bath down remodeled with new walk in Shower, floor Vanity etc. Close to i25 & new light rail stations. Beautiful trees, new back patio area with new landscaping and remember, the OPEN Space behind! Secure Side RV gate. Large flat yard with blank canvas to make it yours, GORGEOUS!